How did you choose your car number? I have been a few numbers in sprint car racing. My first number was 59 because I bought my car off Brooke Tatnell, so we just left it all decaled the same as I was learning to drive a sprint car. My second number 21 came from right before we were suppose start racing for the year and I had no decals yet and was pretty much broke from trying to get my equipment ready for the year and I ended up winning a bunch of money playing black jack at the Meadow Lands casino so I thought it was fitting that I number my car 21 since that money paid for all my decals for the year and I have just left it that so far. 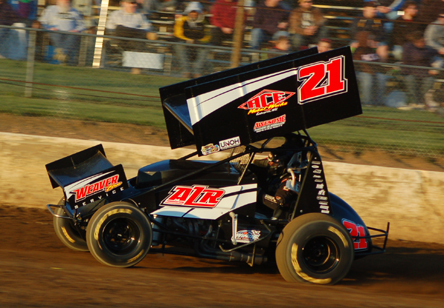 Wins: I am really not sure how many wins I have in other divisions, but I have 10 410 sprint car wins as of 2010. Championships: We have won some kart championships but have never raced any series or track long enough to win a championship yet. Regular Tracks/Series: Skyline, Wayne County, OVSCA wing series, BOSS non wing series. I live about ten minutes from a kart track. I saw a kart in my town and wanted to try it, so my dad got me and kart and that’s where it all began in 1995. I would say my Dad if he didn’t get me a kart and buy me my first dirt car, there would have been no way I would have been able to start racing at an early age. What would you be doing if you weren't racing? Honestly I am not sure what normal people do. My life has been wrapped up so much in racing and that’s all I do and think of, that I am not sure how to be normal. I would probably have money and a nice car to drive around though. The hunt for speed and figuring how to make your car go better than the next guy. Probably my first sprint car win with a wing and my first sprint car win non wing. When I started racing sprints I knew I didn’t have the money some people have, but I just wanted to do it to say I got to do what I always dreamed of doing. But to actually win that first one my first year racing sprints and even winning a race without the wing this year. Just to win in both forms of sprint car racing that I love, meant a lot. I would have to say I could write a book after this season of how to lose a race, between my own driving error costing me a race, to flat tires, parts breaking to getting crashed by other drivers. This was a rough and expensive year, I just hope we can rebound and get running like we were at the end of 2011. Very tough year compared to my first two seasons in sprints. We were fast all year just had so many wins get away from me from broken parts and getting used up at times. We definitely learned to make our car fast with a wing and non wing, we just got to have some better luck. Win more races and run more non wing races. Hopefully run some world of outlaw races and all star shows. I see it being about the same, I think for what the economy is it hard right now for it to grow much. I hope it gets stronger though!